1. 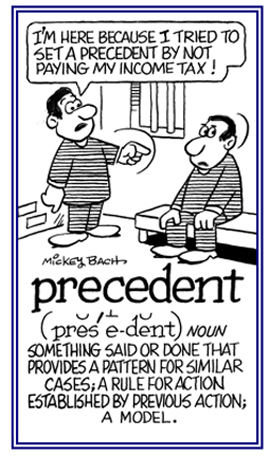 A previous act or instance that may be used as an example in dealing with subsequent similar instances: In law, a judicial decision that may be used as a precedent in comparable cases that take place at a later time. 2. An example that is used to justify similar occurrences at a later time: Margaret set a precedent by being the first woman executive in her company. 5. 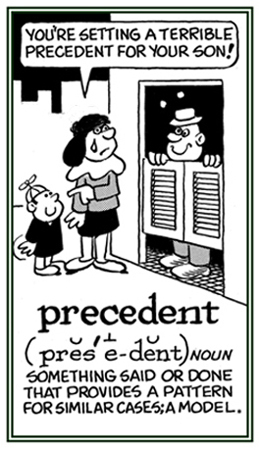 Etymology: "to go before" in rank or importance, from Modern French preceder, from Latin præcedere, "to go before" from præ-, "before" + cedere, "to go". © ALL rights are reserved. 1. A rule, instruction, or principle that guides someone's actions; especially, something which sets standards for moral behavior or conduct: Some people act in accordance with the precept that their proper objectives determine how they should proceed with whatever they are striving to accomplish. 2. 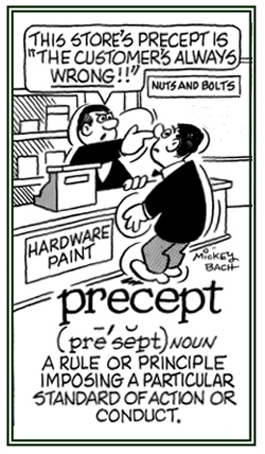 Etymology: from Latin praeceptum, "maxim, rule, order"; from praecipere, "to take before, to give rules to, to order, to anticipate"; from prae-, "before" + capere, "to take." © ALL rights are reserved. 1. A teacher or an instructor; especially, at a university or college: Mr. Mark Stevens was a preceptor of biology at the educational institution that Tom was attending. 2. 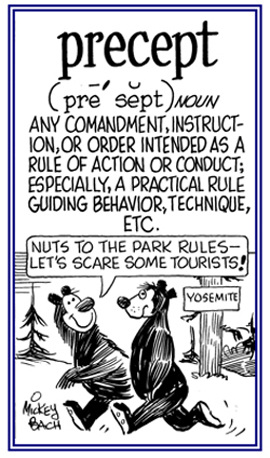 Etymology: from Latin pracceptor from praccept, "warned, instructed" from the verb praccipere, "to give rules to, to order, to teach"; from prae-, "before" + capere "to take." © ALL rights are reserved. 1. Referring to or relating to a physician who gives practical training to a medical student: The retired doctor, who had helped the students become familiar with the difficulties of their chosen profession, was the most important preceptorial instructor the students had had. 2. Relating generally to a tutor or an instructor: To supplement his scholarship, Davis applied for a preceptorial position in the history department at his college. 3. 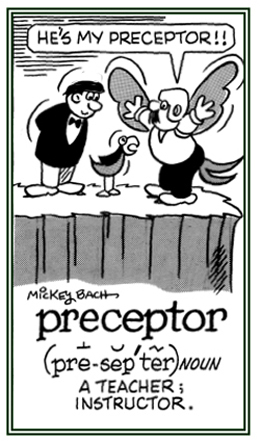 Etymology: from Latin praeceptor, from praecep, "warned, instructed", from the verb praecipere, precipere, "to warn, to instruct"; from prae, pre, "before" + capere, "to take". Referring to how something is done or carried out in a manner like a teacher, head of a school department, etc. : Harrison strolled preceptorially across the campus, enjoying his status as a senior instructor at the boys' school. A period of practical experience and training for a student; especially, someone who is in medicine or nursing and who is supervised by an expert or specialist in a particular field: Hector, the resident completing his preceptorship in the dermatology department, sutured the patient's wound and was watched carefully by the head surgeon. 1. A woman who is an instructor (teacher) or a tutor, especially at an institution of higher learning: Agatha was pleased with her promotion to the position of preceptress at the exclusive women's university. 2. A woman who is the head or principal of a school: The sign on the list of distinguished persons read: Mrs. Johnson, preceptress (1919 - 1925). 1. The act of leading something, as in a line up, personal importance, etc: The precession of the guests of honour at the banquet was written out for the wait staff to understand. 2. In astronomy: the slow, conical motion of the earth's axis of rotation: Precession is caused by the gravitational attraction of the sun and moon, and, to a smaller extent, of the planets, on the equatorial bulge of the earth. 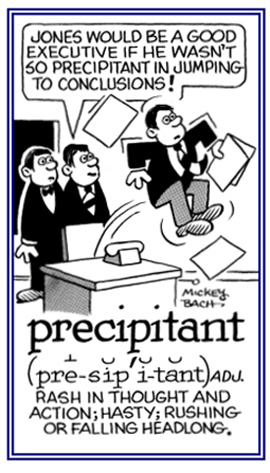 In certain contexts, precession may refer to the precession that the Earth experiences, or the effects of this type of precession on astronomical observation, or to the precession of orbital objects. Descriptive of that which has been separated and cast to the bottom of a solution in a container: The precipitable substances in the test tube sank slowly to the lowest end of the glass cylinder. An action or thought marked by impulsiveness or rash haste: Quite often there is a precipitance, or abruptness, among young people. The precipitance and quickness of the faculty members in submitting their resignations took the Board of Directors by surprise. 1. A reference to something that has been done with great haste and without proper deliberation; regarding someone who is impulsive; hurried: The precipitant people, who were a group of workers, suddenly rushed into the conflict and disagreed about how to remodel the apartment building. 2. Etymology: from Latin praeciptans, "cast down headlong" from praecaps, "head foremost, headlong"; from prae-, "before" + caput, "head." © ALL rights are reserved. With great haste; with rash unadvised haste; with tumultuous speed. Showing page 3 out of 19 pages of 275 main-word entries or main-word-entry groups.